In May 2012, I began my fitness plan with the Insanity Workout. I finished it with great results(strengthened my whole body and I lost 20 pounds), but because it is such a high-intensity program and really beats up your body, there is no way I wanted to continue that for the long term. So instead, I'm currently following Body for Life® 's exercise program. 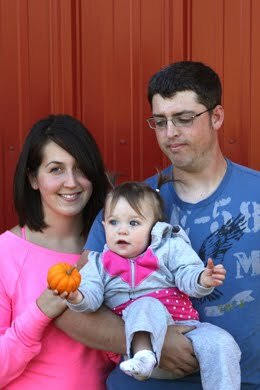 I was able to talk with my sister-in-law, Lyndsy, about it for quite a while, and after seeing how great it has worked for her, I decided to try it out for myself! Although Body for Life doesn't advise this, sometimes on my weight training days, I will also do cardio... it depends what my body feels like on those days. I may also do cardio for more than 20 minutes on my cardio days. For every major muscle group in upper and lower body, I only perform two exercises. I rotate which two exercises I choose for a given muscle group so that my body never gets accustomed to the same one. For the first exercise of a muscle group, I will perform 5 sets using these repetitions: 12x, 10x, 8x, 6x, 12x. I rest for about 30-60 seconds in-between each set. For the first set I will start with a lighter weight and then with each following set I will increase my weight, except for the very last set. For the final set of 12 reps, I will go back to the original lighter weight. Increasing weight with each set is known as pyramiding and works well for building muscle. For the second exercise of a muscle group, I will only perform 1 set of 12 repetitions using a lighter weight. 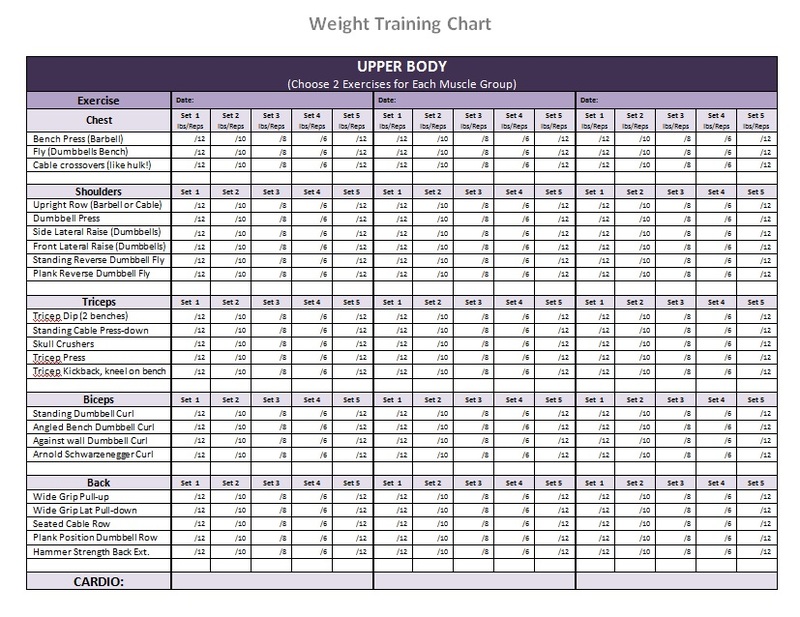 Below is a list of all the weight training exercises that I do for upper and lower body. 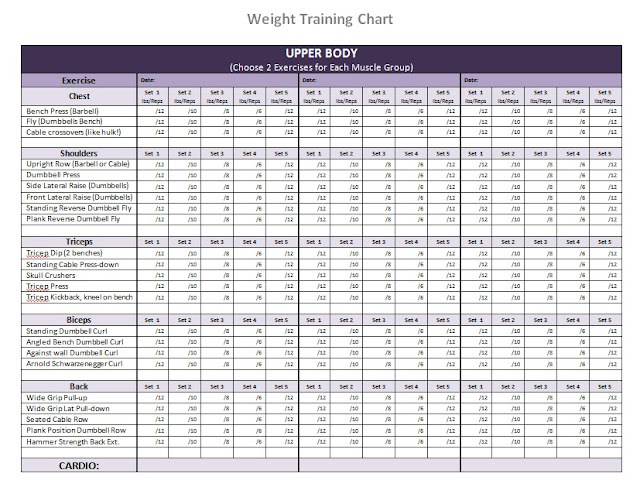 As shown in the chart above, I do upper and lower body weight training exercises on separate days. Just as a final note, remember not to overwork yourself or use weights that are too heavy for you! Hurting yourself will only result in you not being able to exercise, pushing your goals even further away.